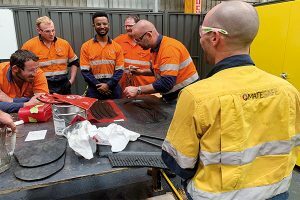 The first batch of trainees from Rema Tip Top’s training academy are now getting real world belt splicing experience as the mining industry prepares for a potential skills shortage. A skills shortage is expected to continue within the mining sector as the industry competes with other growth industries around the country. This is according to recruitment agency Hays, which has found the shortages have become a national issue since they emerged in Western Australia and Queensland early 2018. Enrolments into mining engineering and related disciplines have also dropped according to the Minerals Council of Australia, which also warns of an impending skill shortage by 2020 across the sector. Allan Warren, Head of Training at Rema Tip Top, says the shortage is partially due to an image problem. “When you think of a skilled tradesperson, it’ll most likely be a carpenter or an electrician with a dog in the back of the ute,” he says. In particular, he says that conveyor systems are often go overlooked when it comes to their vital role within the industry. Since their introduction in the early 20th century, conveyors have allowed mining companies to greatly improve their productivity. New Industries WA estimates the mining industry utilises some 55,000 kilometres of conveyor belt across Australia, carrying thousands of tonnes of material every day, and if they were to stop working or require repair, there is a potential for significant productivity delays and lost revenue. Despite the fact that belt splicing skills are highly sought after in the industry, Mr Warren says they too suffer from poor perception. “Belt splicing work is difficult and requires unique skills which impacts its attractiveness. A lot of that has to do with the lack of recognition for the trade, which is what we’re aiming to change,” Mr Warren explains. Despite iron ore tonnage production forecasted to grow to 887 million tonnes by 2019-20 by the Australian Office of the Chief Economist, polymer processing apprenticeship and traineeship enrolments have plunged from a high of 263 per-year in Western Australia in 2002 to averaging below 22 students per-year since 2011. Rema Tip Top identified the market’s critical need for more high-quality belt splicers and has partnered with its major customers to invest in the growth necessary for the mining industry. Through its own registered training organisation, the Rema Tip Top Academy, it is equipping the next generation of belt splicers by providing the training required to upskill trainees into specialised tradespeople with the best practice skills and safety knowledge. As part of its offering, the Academy introduced a Certificate III in Polymer Processing, which they hope will achieve national-level recognition from an industry-wide body. Currently, Queensland is the only state in Australia that considers belt splicing a recognised apprenticeship trade qualification, but Mr Warren is looking to change this. “We are currently lobbying the Western Australian and New South Wales governments to start an apprenticeship scheme,” he says. The polymer processing course takes around 18 to 24 months to fully complete, depending on the trainee’s ability, and focuses heavily on teaching safety, technical skills and accuracy. It is comprised of 21 units that teach students the processes needed for belt splicing including specialised training for fabric, solid woven and steel cord belts. Trainees go through a rigorous selection process, including an interview to understand their background and any transferrable skills. From there, the trainees begin a 10-week training course, where they attend classes at Rema’s Perth facility and learn the theory behind the work. Skills such as how to use a knife correctly and belt vulcanisation are taught in a controlled environment, to allow students to safely learn without the pressures of being on a site. Trainees are then mobilised to a mine site in the Pilbara, where many get their first experience working on a fly in, fly out schedule. Trained assessors work closely with the students to help keep them safe, physically and mentally. Tom Fraser, general manager Rema Tip Top Industry West, says the training course is part of the bigger picture when it comes to the company’s long-term investment into the industry. Knife skills and belt vulcanisation are taught in a safe environment. “The industry has had a shortage of belt splicers for a long time across the country. There is a gap in the market when it comes to training and many of the specialised employees are now reaching an age where they are leaving the industry,” he says. “This joint investment and long-term strategic planning in partnership with our major clients both makes this program successful through on the job training and creates a sustainable workforce which our customers can have confidence in when hiring. “Belt splicing is high risk work, so to reduce the risk of incidents we aim to set a new benchmark of training for the sector,” Mr Fraser adds. The first crop of trainee belt splicers graduated from the training program in October 2018, with a second group beginning their training in January 2019. Rema aims to add around 70 employees through traineeships year on year and expand its offering into areas such as the rubber lining and mechanical trades. Through recognised prior learning, the RTO is also placing its experienced workers on a pathway to nationally recognised certification and is set to issue a further 68 certificates in 2019. As part of the graduation process, the company has also named its inaugural trainee of the year. Remi Carter went through the program in 2018 and has since been employed full time by Rema, where she works on site at its operations with Fortescue Minerals Group. She began her career working in a manufacturing centre inspecting conveyor belts, which is what inspired her to become a belt splicer. “It was something I was good at and I wanted the chance to get even better at it,” she says. “I was looking for more opportunities even though some people said it wasn’t a job for a woman. I wanted to further my career and so I decided I would take the opportunity to learn anyway. “The course was great, and the site work especially was really eye-opening. The team helped out a lot and I was able to get hands on while learning. We were out there every day cutting belts or helping prepare for setting up work areas.” Ms Carter adds. Four more intake programs are planned across WA this year, with one to two to be run in each of Rema’s NSW, SA and QLD training centres. Throughout this process, there has not been a single drop out, which Mr Fraser says is indicative of its success. “The feedback we have received from our clients has been fantastic. They’re not only impressed by the quality of the people we are sending over, but with our selection process too,” he explains.